I’ve been wondering about that for some time now, but it became clear today. I cannot deny smelling other people’s perfume and thinking they might consider improving their perfume taste. Honestly (it seems this is going to be a rant), I can understand companies forbidding perfumes because if my colleagues wore stuff like that, I wouldn’t mind the ban. I don’t know if I was specially sensitive to it today or it’s the fact that everyone is back from vacation but the times today I inwardly cringed (at least I hope it was inwardly) at the marine and synthetic musk notes in the air is still making me wonder how much money do those perfumes actually bring to their companies. They are actually the ones guilty for the companies being allowed to ban perfumes from their midsts. I mean those perfumes are radioactive – they take over the space of 5 square metres and once there, they are relentless in their need to occupy it forever. I shudder just thinking about it. I don’t think other person’s perfume should clobber you over the nose and then keep you there without any help. Because that’s what they do, they take over your space if you closer than 2-3 metres from it. Sillage is all good but if I can smell so much of it in the middle of a city, well, I’d say that is way too much of it. Now I’ve said all this, I generally don’t judge people by the perfume they wear. Personal taste is just that, personal. But when your personal taste takes over my space and won’t let me be, well, I do have a problem with it. And I do believe it’s a modern perfume problem, sillage used to go with you in times before and lessened after an hour or so, this seems to hang there in the air for what feels like forever. Is it just me? Is there anyone else who slightly judges people by the perfume they wear? And is it just me or are the synthetic long-lasting musks going on other people’s nerves as well? Ines, I think you’re mixing two different issues: quality and quantity. In my opinion, it doesn’t really matter how great a person’s perfume is if I have no harbor from it. In the office (plane/theater/etc.) environment I just have no escape from the person wearing too much – be it a masterpiece or the cheapest drugstore offering. 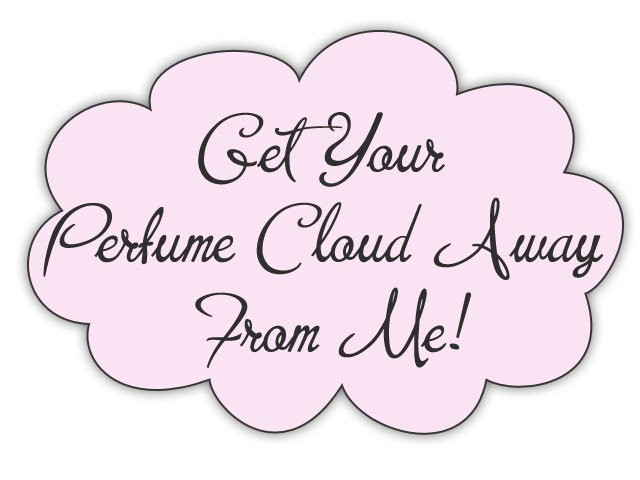 If in business (or similar) setting you can smell a perfume – any perfume – being more than a meter away from the person (I’m not talking about a whiff when they pass by or a very light presence in the air) – it means they wear too much of it. Period. That’s true. But then again, I am very sensitive to the clean synthetic musks which just won’t stay close to a person but tend to occupy a lot of space. I don’t mind the quality (maybe just a little bit) but I don’t think the quantity makes much of a difference. Those musks are made to last forever. Sometime testing one spritz of a perfume like that will ruin my nose for hours as it gets stuck in there and I can’t get rid of it. Then again, wearing too much perfume is bad as well. Especially if it’s something unsuitable to your taste. Plus, it shows bad taste on the part of the wearer. Then again, the fact that people never take other people into consideration is no longer sth that amazes me. It has unfortunately become standard. I must say that one of my co-workers (not in my department) wears sometimes some awfully smelling perfume – we (I’m not the only one who noticed it) think it’s some natural oil and we hate it but do not know how to tell her. The worst part is that she probably doesn’t smell it much since she’s a smoker and she uses it to “cover” the smell after she smokes. Basically what I said is, you not only bought a lousy perfume, you also sprayed so lavishly half the city can smell you. Generally speaking though, I can tolerate those kind of musks in small quantities on other people (not on me). I think I might be overly sensitive to it, as I noticed when talking to other people, most of them don’t seem to smell it as strongly as I do. I also am a perfume snob….but this “synthetic musk” thing is bothering me. 99% of all musks on the market, even the $300+ options are synthetic. Thanks goodness we are not still clubbing animals in the head and slitting their throat for perfume like a bunch of deranged savages. Maybe you want to clarify exactly what type of musk you are talking about since almost any musk you encounter is going to be synthetic. That’s true, I should have clarified it better. I do think you can actually get a botanical musk note as well? But basically, the one I object to the most is the clean, laundry one. The one designed to make you think of clean clothes and the one that makes me sneeze. I couldn’t tell you its precise name because I don’t know it, I just know it gets used a lot and can often be found under notes as white musk. Musk smog alert! I often wonder, as you do in your opening lines, how to improve somelse’s perfume taste. Sounds like a post for your site which we can then all reference. We could then refer our work colleagues to your post via email. Issues of over-application aside, I do share your loathing for synthetic musks. At least, the white synthetic musk that smells like fabric softener sheets or laundry detergent. It drives me INSANE, but then I don’t get the whole fad of “clean, fresh” or soapy fragrances to begin with. If I want to smell as though I just stepped out of a shower or of soap, then I wouldn’t want to spend a small fortune on fragrance to do that. Ultimately, it seems to me as though many people who want to smell of “clean” white musk are people who don’t like actual perfume and don’t want to smell of it. So, buying perfume in order NOT to smell of perfume…. um??!!! Well, if they want to do that, it’s their choice, but don’t expect me to respect anti-perfume people or to agree with perfume companies who go along with this ridiculous trend (all thanks to that blasted Acqua di Gio, in my opinion) by creating cheap, synthetic, white musk fragrances and then charging a small fortune for it. The whole thing is a huge sore point with me. I feel bad now for not coming up with a longer answer, but I agree with everything you said. I’ve always felt that perfume should be like a secret between you and someone very close to you. Everyone else merely gets a faint whisper. I like that idea. 🙂 There’s no need to shout your perfume preference of the day to the whole world – I somehow consider my perfume of the day significant for my mood so I don’t want to give too much away. But what about a form of stealthy conversion? For example, perhaps you start a friendly conversation with a perfume offender in your office by saying something like, “I noticed you like perfume, and I was wondering if you might like to try this scent I love called Hermes Hiris. I realized the other day that I had an extra decant of it, and it made me think of you.” That kind of thing — a way to open up a dialogue and influence taste and maybe even style of use (application)? Suzanne, your idea of stealthy conversion appeals to me and I do tend to lean that way when it comes to my family and friends. And where I work, perfume isn’t an issue. Only one colleague wears a perfume I really don’t like but as she’s sitting nowhere near me, it’s not an issue. It’s just that I get assaulted by such incredible amount of synthetic musks each time I go through the city that I felt the need to vent. I have successfully used the ‘stealthy conversion’ approach with a few friends! But I must say that this post strikes a chord with me because I went to London the other day and by the time I had got onto the platform at the train station (ie right at the beginning of my journey) I had already had my nostrils assaulted by several pungent men’s aftershaves and one floral fruity sugarbomb from a female passerby. So these twin notions of snobbery and unsociable sillage were very much in my mind! I think the only thing I am guilty of judging is when adult women who should know better (say 35 and up) wear teenage girl fruity sweet sugary confection perfumes. I just don’t get that.